Jiangzhou Immortal Bridge in Guangxi Province, China. Photo by Ray Millar (click image for larger version). Jiangzhou Immortal Bridge is a meander natural bridge eroded through karstic Devonian limestone. 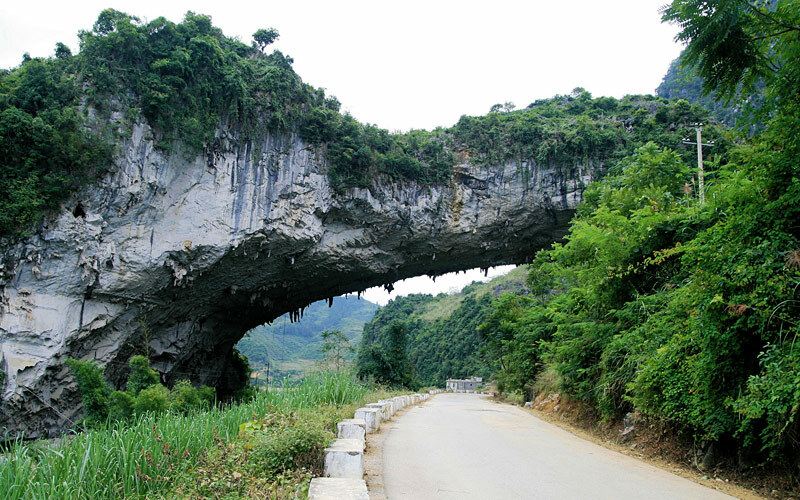 It is located about 2 km east of the village of Jiangzhou in Guangxi Province, China, about 30 km south of Fengshan. 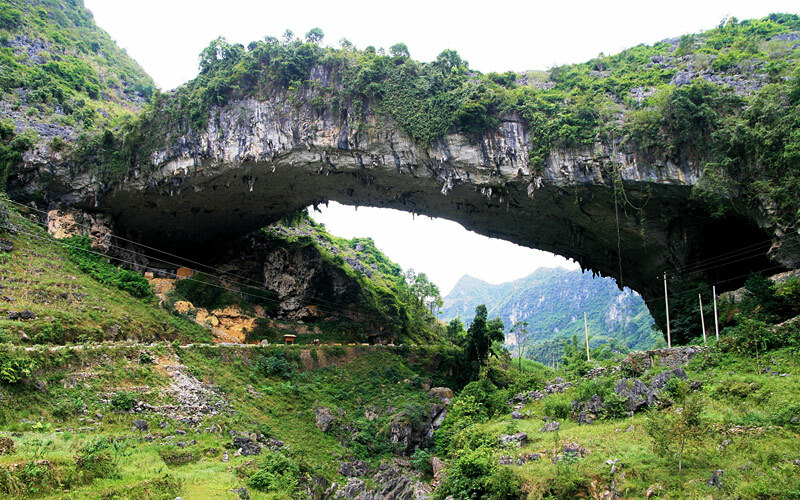 It is a principal feature of the Xianren Natural Bridge Tourism Area, which is a southern unit of the Leye-Fengshan National Geopark. Both a paved road and a river pass under the bridge, as do some utility lines. A sign by the arch claims it's span is second in the world. Whereas this may be true, at the present time this cannot be confirmed due to conflicting information about the arch. An upper bound for the span can be placed at about 340 feet, which would indeed make the span the second longest in the world, and a lower bound can be placed at about 280 feet, which would make it very close to the spans of Landscape and Kolob arches in the U.S. (see Measurement of Jiangzhou Immortal Bridge for details). Jiangzhou Immortal Bridge from the east. Photo by Ray Millar (click image for larger version). 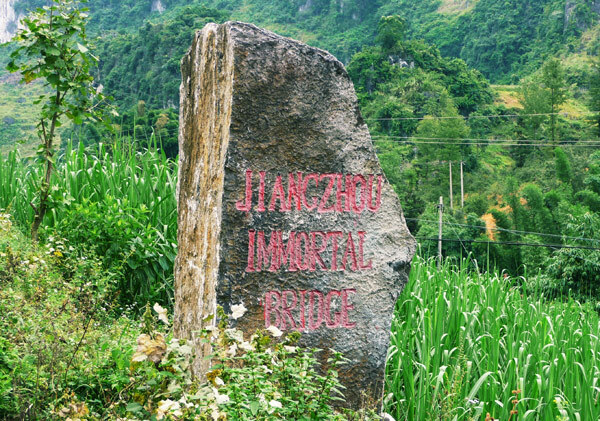 Two old signs by the bridge, carved into rocks, provide the name Jiangzhou Immortal Bridge. A newer sign, in wood, provides the name Jiangzhou Natural Bridge. Under the northern (upper) end of the arch is a small Yongning temple, constructed of adobe and containing some Ming Dynasty artifacts. Sign carved in rock next to the road just east of the arch. Photo by Verena Jung.